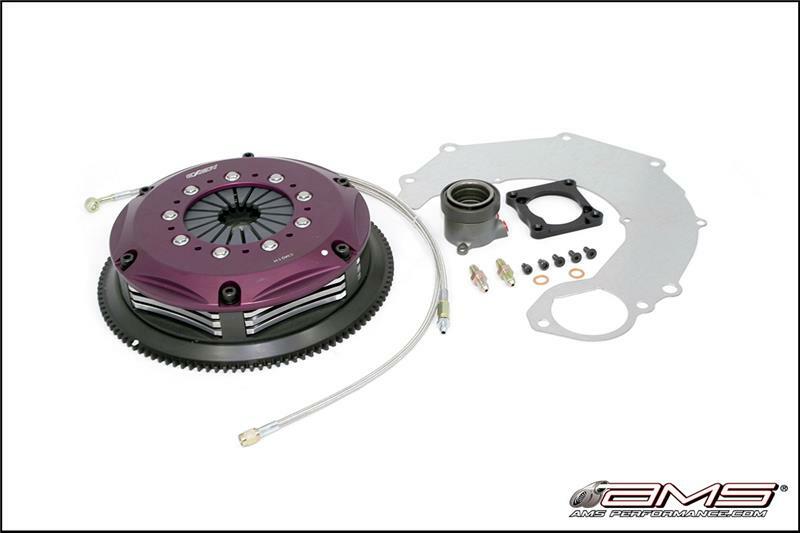 AMS Performance Push Style Clutch Kit MITSUBISHI - Pann Auto Performance - San Diego largest aftermarket automotive performance parts - What do you drive? The AMS/Exedy Push Style Multiplate HD Clutch Kit is the solution for worry-free high RPM shifting. Only available through AMS, this clutch kit has been converted to a more reliable push style actuation utilizing a hydraulic throw out bearing. The same design that was developed and used on our World Record Holding Drag and Time Attack EVO VIII’s is now available to the public. As we pushed the RPM higher, we found the limit of the factory pull style clutch clip which comes unclipped at speeds well outside factory limits. This new product is designed especially for vehicles with up to 850 wheel horsepower while producing far less heat then a standard clutch. The clutch is very streetable and comfortable to drive, but suggested for racing applications only. Pedal pressure increase is approx 10%. Great for drag & road racing.